The Decemberists have been one of those bands that I undercover loved over a long span of time, making additions to my music library gradually over the years. I was relatively high-strung (a common thing for me, I guess) leading up to this show, especially as it the wrap-up to my string of birthday celebrations. Colin Meloy’s voice is so distinctive and his writing style matches perfectly with it. Many of their songs are rooted in naturalistic themes, including their latest release, an EP titled Florasongs, that included extra songs that didn’t make it on their 2015 full-length What a Terrible World, What a Beautiful World. We got to hear plenty from both records and Meloy expressed how he loved all of the songs so much that they couldn’t not put them out there for the world. The full length was very well received, as it was the first album from the band since 2011 – this also explains the overflow of songs. The almost mythical or Renaissance-styled backdrop on stage was striking. It also paralleled with the living world, which many songs on these new albums reference. It was magnificent up close, but was even more striking when seen from afar. 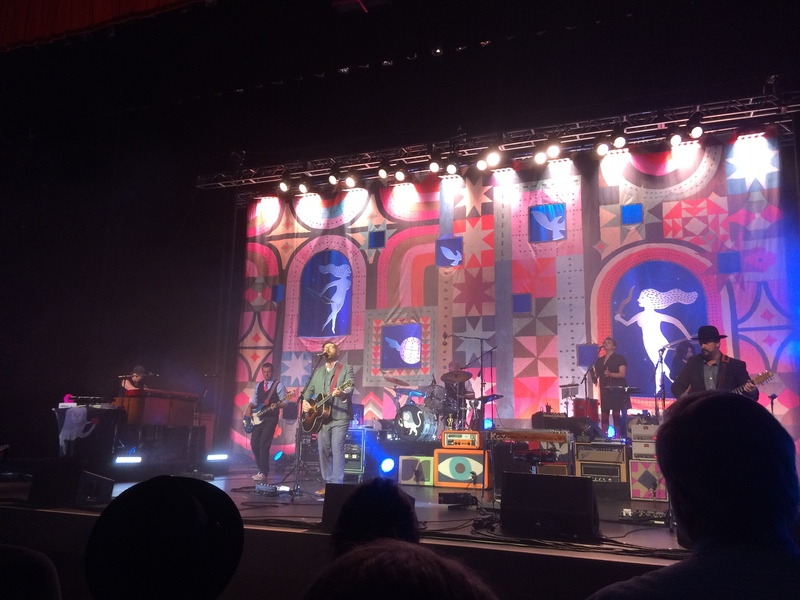 I had heard that Decemberists’ shows often included some audience participation. Well, we definitely were part of some organized call and response. I think we sounded pretty good? The show closed out the Iroquois Amphitheater season and although I was a little upset with the attendance for the show, I was glad to be there. For a season that started with a rainy, albeit sold-out, Neutral Milk Hotel show, the rest of the summer was a bit disappointing considering the quality of names that came through – Grace Potter, Punch Brothers, Umphrey’s McGee and The Decemberists were all under-attended. Nevertheless, the venue provided the ambiance that only accompanies at an outdoor show, an experience I have grown to love.